Like many creatives, I often find myself daydreaming about my next big sewing project even before my current project is complete. Whether in the car, walking my dog or even brushing my teeth, custom fabric projects are always on the brain. While on a trail run, I dreamt up my race bib running top. 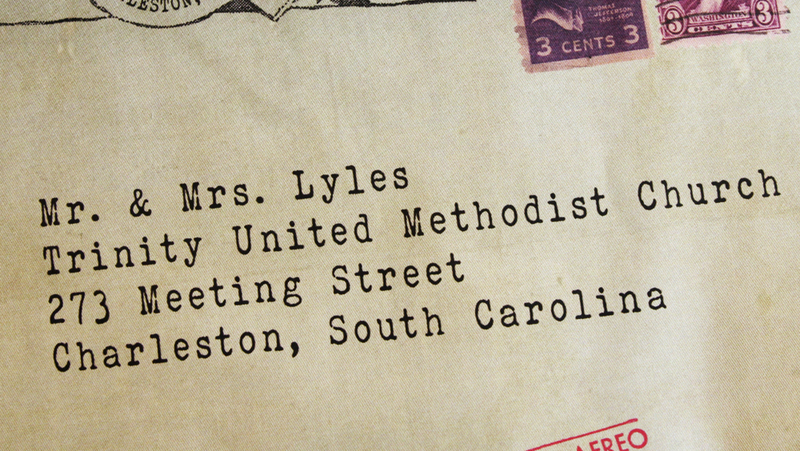 Most recently, while getting the mail, the lightbulb went off for custom pillows inspired by vintage envelopes. These pillows look great on Linen Cotton Canvas, Eco Canvas and Heavy Cotton Twill, but I was excited to try Spoonflower’s newest fabric, Lightweight Cotton Twill. This lightweight fabric is both soft and durable, is easy to work with, and is a perfect addition to your couch when made into a pillow. 16″ pillows are ready to be sewn and delivered to three newlywed couples! 1 yard of new Lightweight Cotton Twill makes three 16″ pillows (finished size is 15″ square). Only want one pillow? Order the front and the back as two separate fat quarters. To get started, set-up a Photoshop canvas at the size you’d like your finished pillow to be, making sure to include any seam allowance. My pillows will be 15” x 15” with a ½” seam allowance so my canvas will be 16” x 16” or 2400 x 2400 pixels. 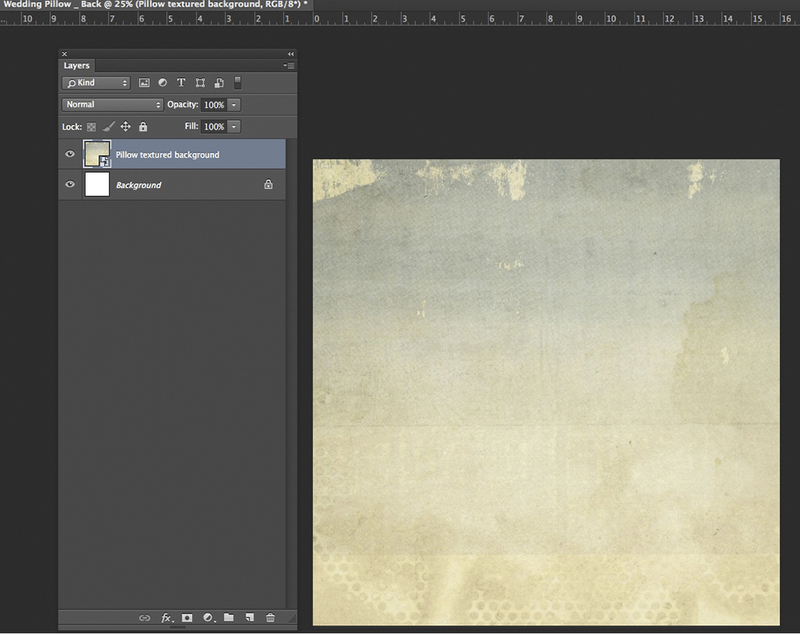 Once you’ve created your canvas, add a textured background to mimic paper. I created my background in Photoshop but you can also find great pre-made digital paper backgrounds on Etsy or www.textures.com To add your background, select File > Place Embedded and choose the background texture. If you plan to use this background for the back of your pillow, save your file as a Photoshop file and JPG before moving to step 3. 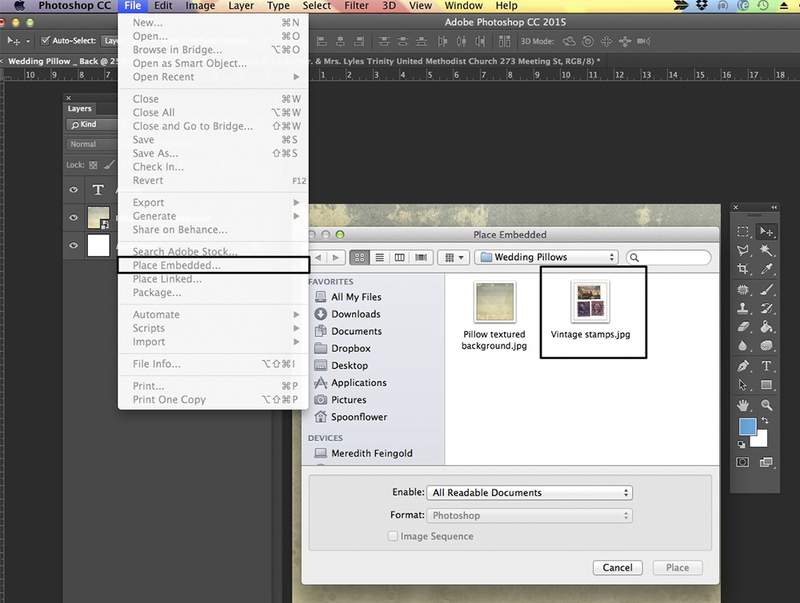 To save a file, select File > Save As and choose the JPG or Photoshop option. I recommend saving this file under the name Wedding Pillow _ Back. 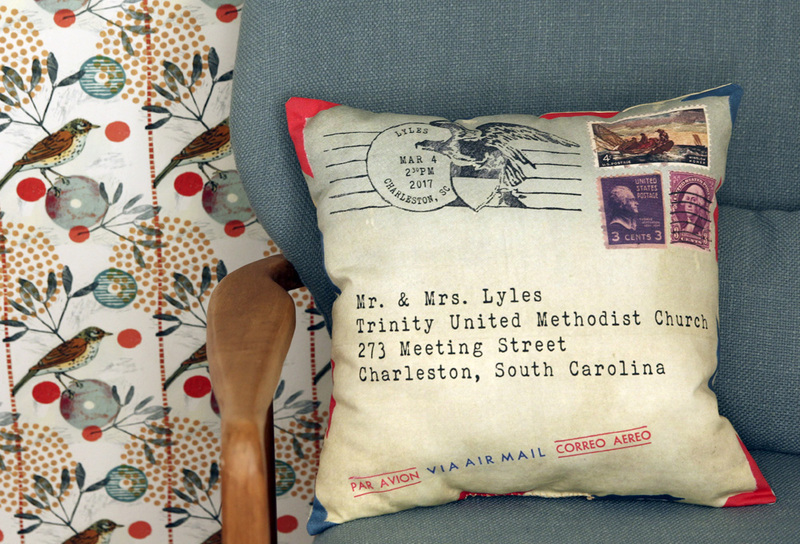 Add the wedding ceremony or reception address for an extra personalized pillow. 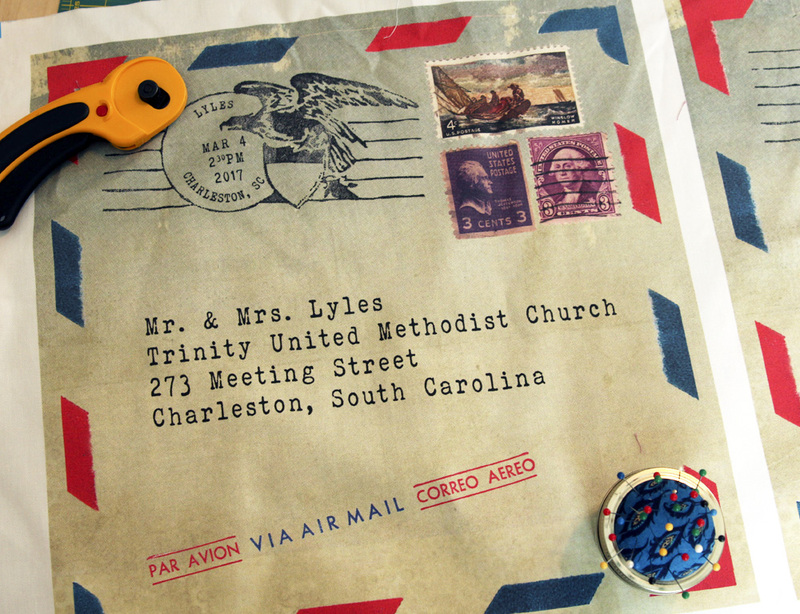 The part that really makes this gift one of a kind is the addition of the couple’s wedding details. 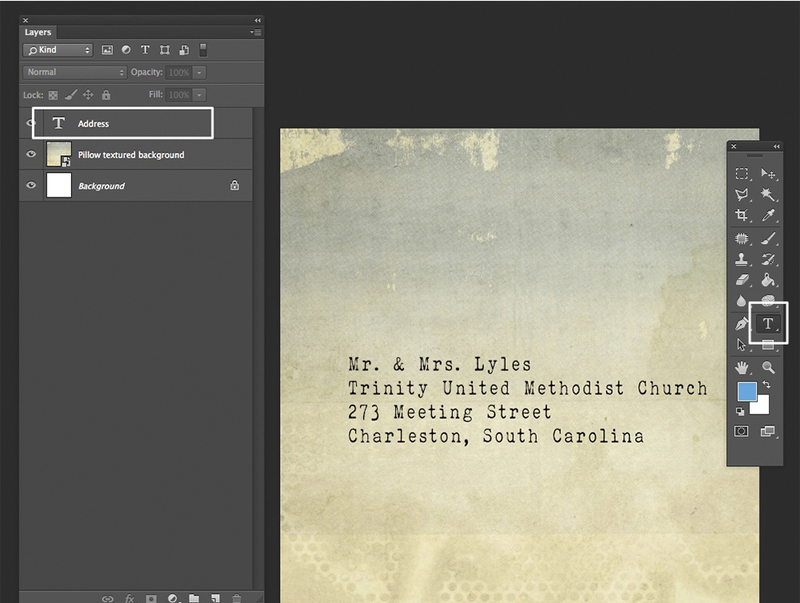 Select the text tool and add the church or venue address where the couple is getting married. 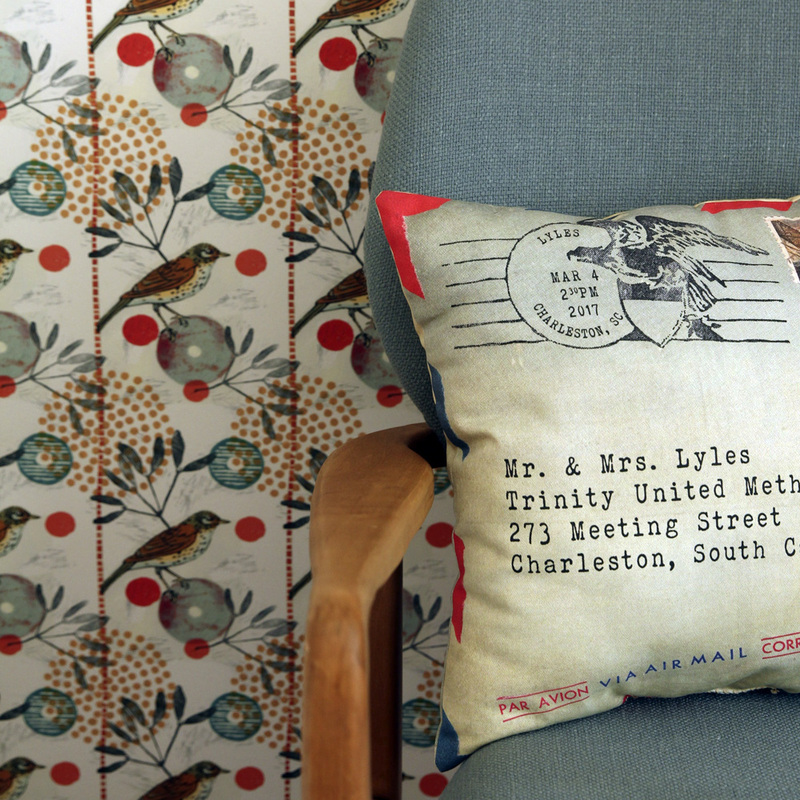 Vintage stamps give this pillow a realistic envelope feel! 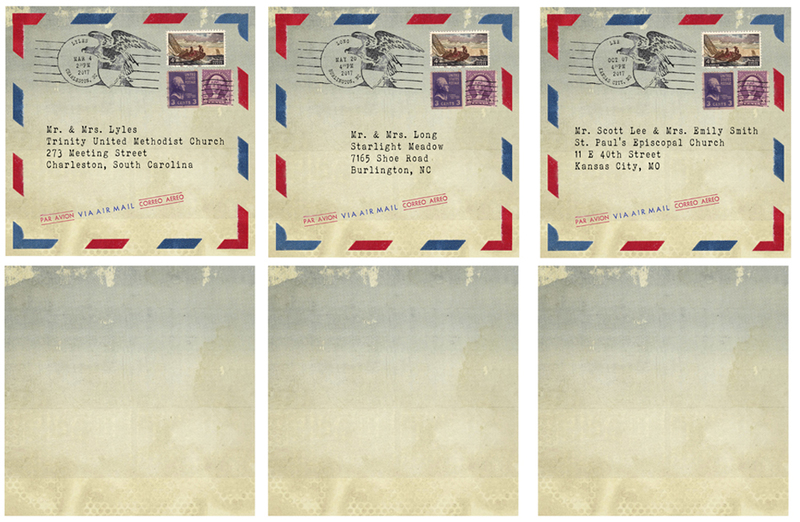 The design canvas is looking more like a vintage envelope with the addition of stamps! 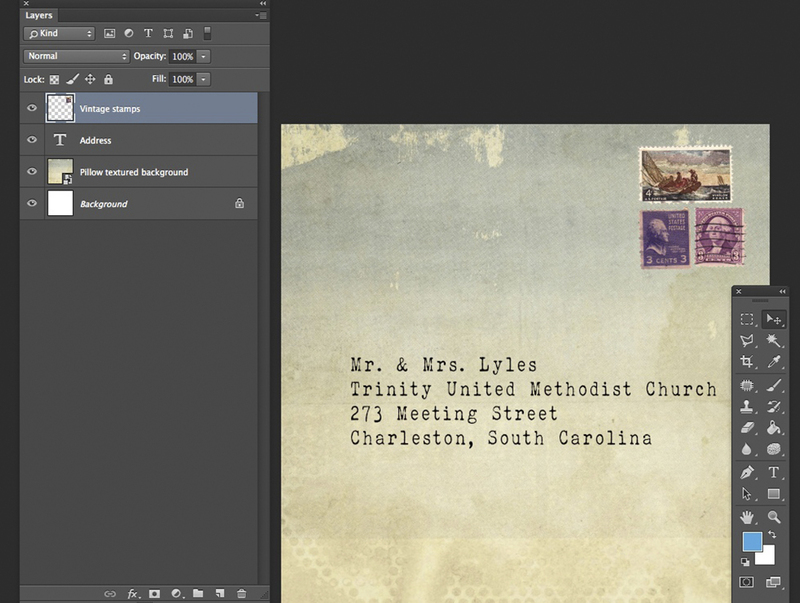 To create a mailed letter effect on your pillow, add images of postage stamps to your canvas. Etsy is a great resource for digital downloads and I used this set from KGAKreationsLLC. 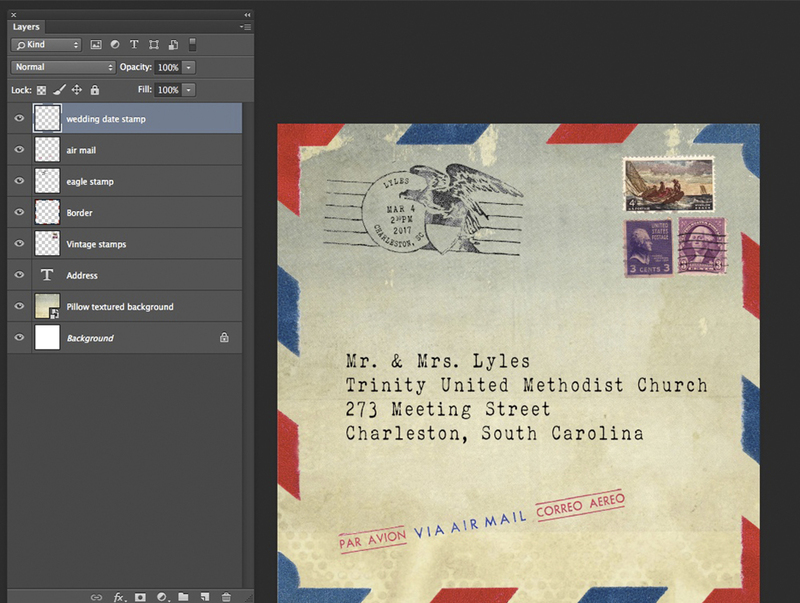 Once you have your images, add each stamp to your canvas by selecting File > Place Embedded and select your stamp. A custom time stamp, using the wedding ceremony details, is one more way to make your gift extra personalized. To add a final element of personalization to your pillow, create a custom time stamp. I used this helpful tutorial but if this feels too advanced, you can leave this off the pillow. I like to use the wedding date information in the stamp, so knowing the time of the ceremony, date and city of the wedding will be helpful. 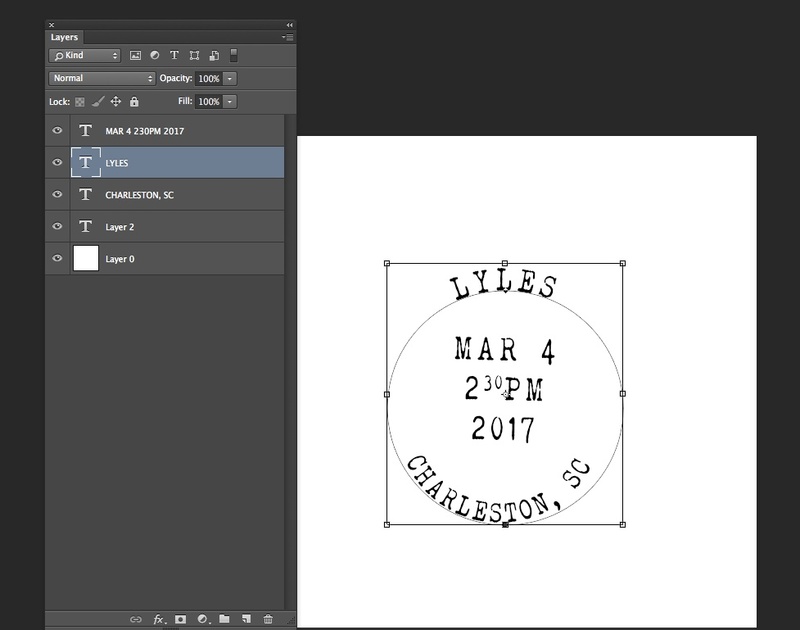 Once you’ve created the stamp, save the file as a JPG and add it to the canvas following the embedding directions in step 4. Once complete, save the file as a PSD (Photoshop document) and JPG, making sure to RENAME your file to ensure you don’t override the background file you saved in step 2. At this point, you can order the front and back of your pillows as fat quarters. 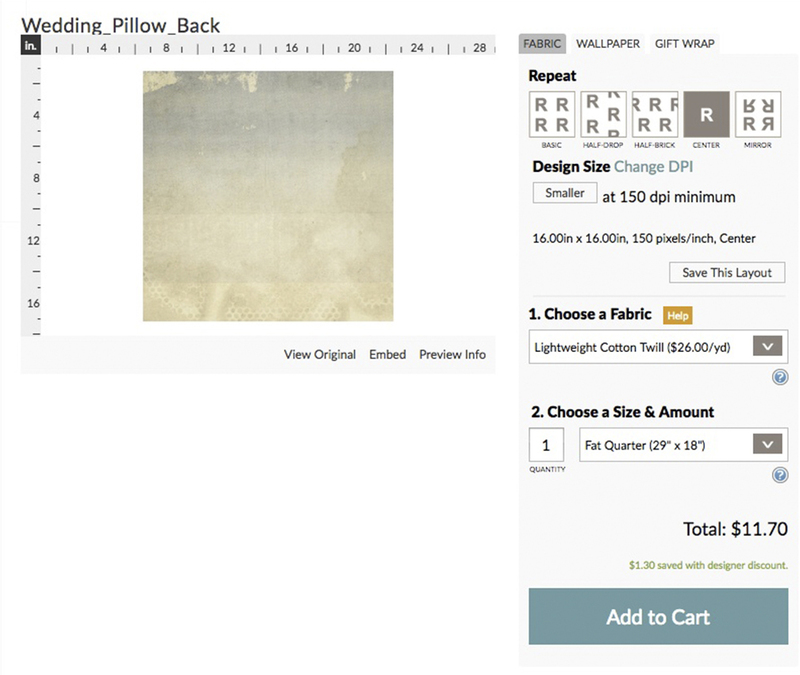 Once logged into your Spoonflower account, select Design > Upload and choose the JPG version for the front of the pillow. Select the Lightweight Cotton Twill and fat quarter options in the drop down menus. When ordering a 16″ x 16″ design on a fat quarter, be sure to select the center repeat option to ensure you get one complete image! Add the design to your cart. Repeat step 7 for the backside of your pillow. One yard of Lightweight Cotton Twill can yield three 16″ x 16″ pillows! If you’re like me and find yourself attending more weddings than you can count, this pillow design can come in handy! In Photoshop, I was able to fit six 16” x 16” panels on one yard of Lightweight Cotton Twill (58″ x 36″). 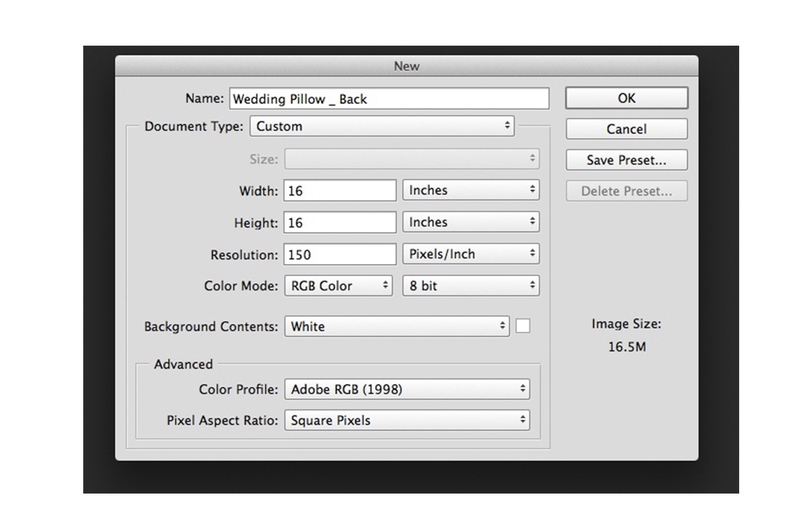 Just save one big file with all 6 pillow pieces as a JPG and upload it to Spoonflower. With enough panels to make 3 pillows, one pillow was just $7.80! Once your fabric arrives, sew your pillows following your favorite tutorial. Not attending a wedding in the near future? This project could work as a house warming gift for new home owners using their new address and move-in date! 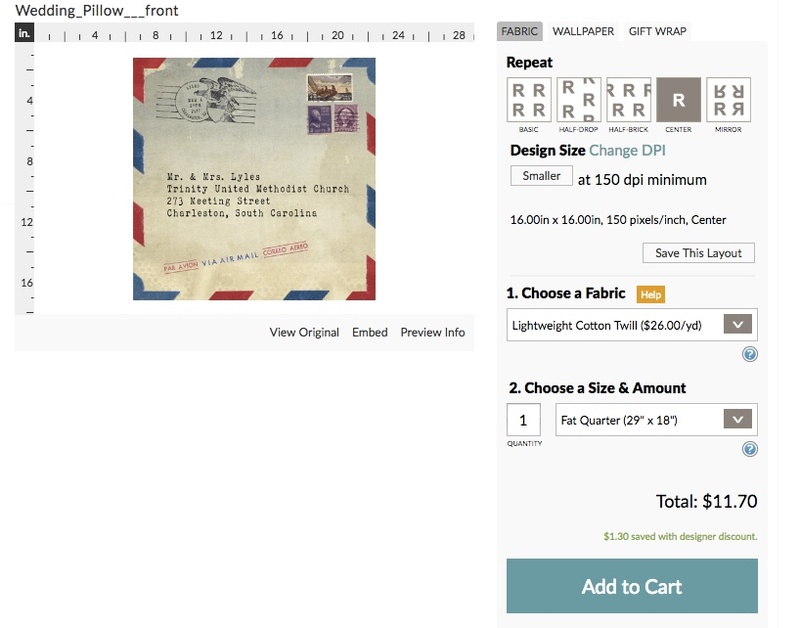 Inspired to make your own custom envelope pillow? 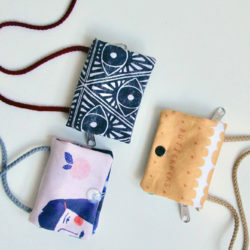 Be sure to share your project with us by tagging #spoonflower. Wow! I didn’t realize you could upload a whole yard as one file. Whenever I try, even at 150 dpi, I always have files too big to upload. Will investigate some more, thanks! 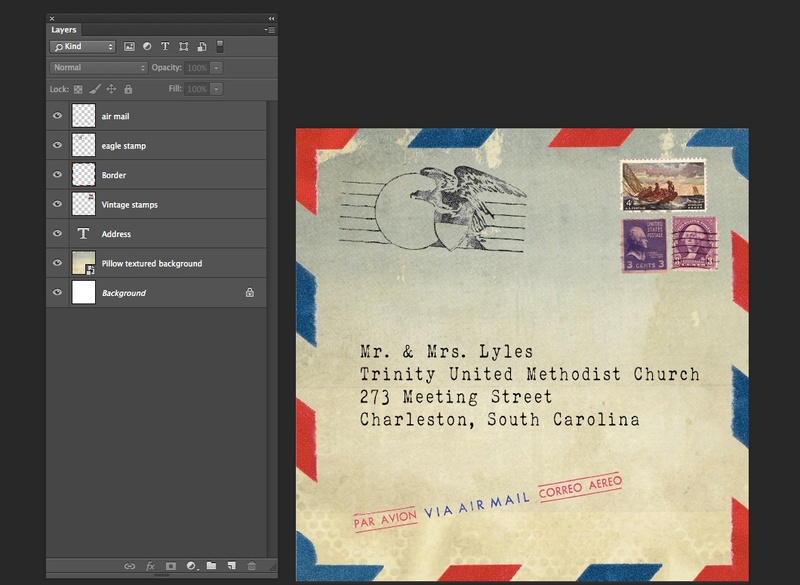 What a cool creation…..thanks for the tutorial! 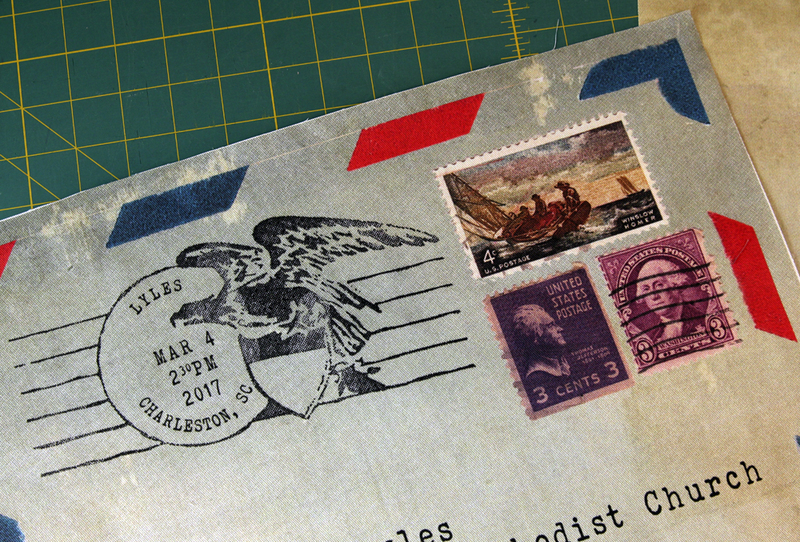 Can you provide a link for the graphics involved in the border around the envelope, cancellation stamp with eagle, etc. I downloaded the stamp file you suggested. Thanks for a beautiful project! 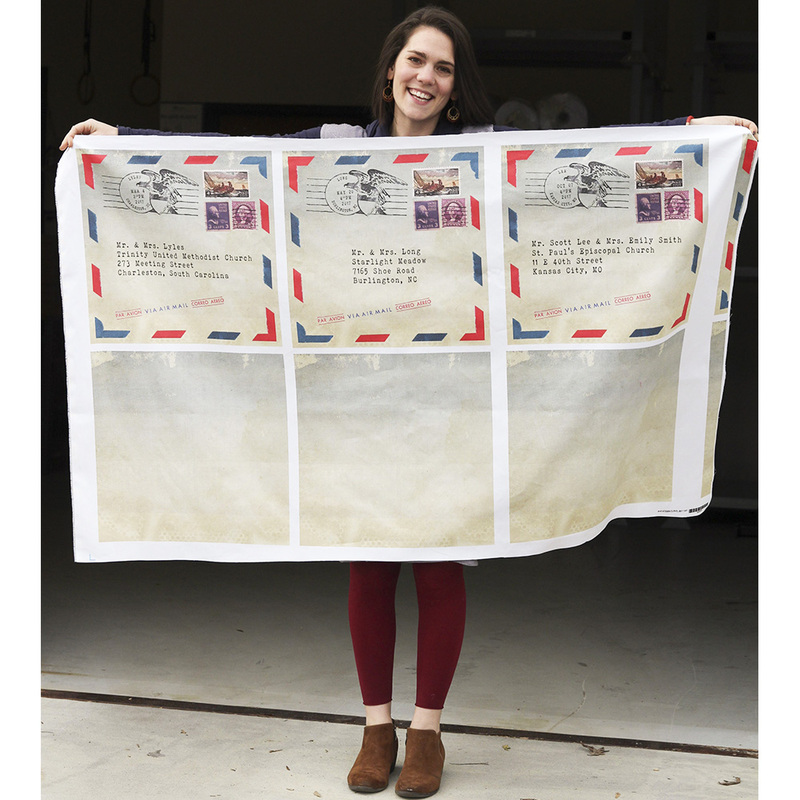 I’m so glad you’re interested in creating your own vintage envelope pillow! To create the border, I used the same set I link to in the blog post ( https://www.etsy.com/listing/219157608/instant-pdf-download-full-page-of?ref=shop_home_active_3#). 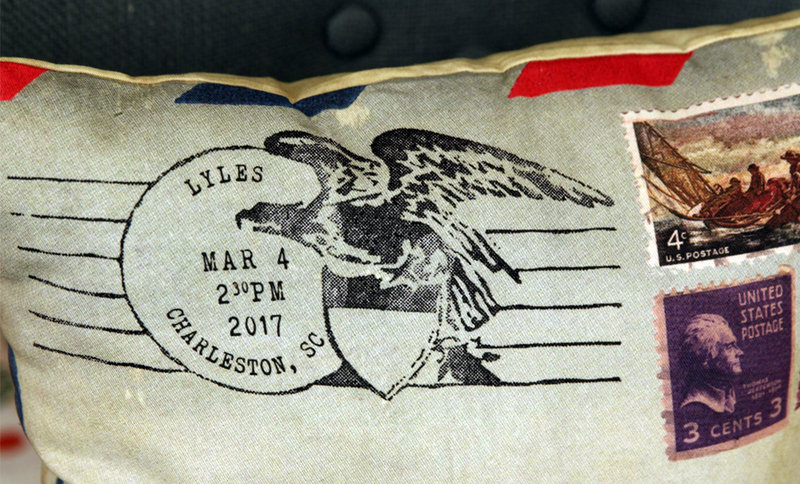 There is an envelope with the border so I took it into Photoshop and cropped out all the design elements except the border. I unfortunately am not computer savvy. 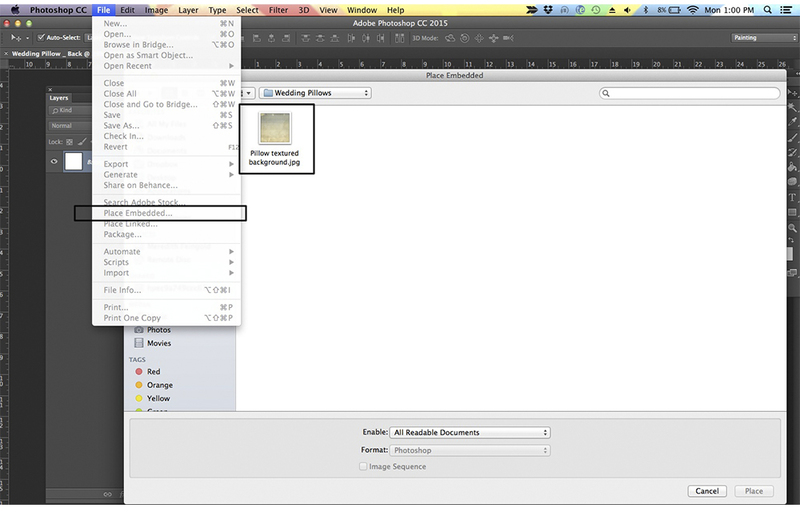 Is it possible to send you the writing and you set the file? 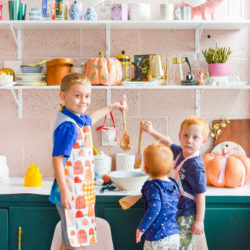 I have 3 sisters and LOVE the idea of the tea towels and the pillows. We get together often but have a sister trip once a year. 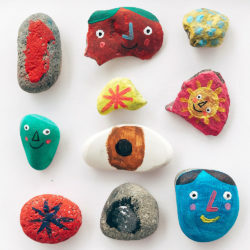 This year will be 25 years and this would make a WONDERFUL gift for them. Please let me know if that is possible. While we are unable to create designs for customers, we are working on a template that you can easily customize in a free design program like PicMonkey. Stay tuned for more details on this blog post! 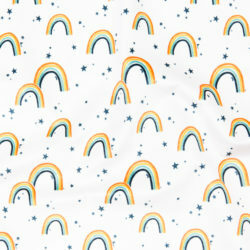 I would love to order this fabric but I don’t use photoshop is there another way to do this? We are working on a template that you’ll be able to edit in a program like PicMonkey ( available through Spoonflower) or Microsoft paint! We’ll update our blog post once the template is ready and we hope it will help you make your own custom pillow! Its too bad that the templates can’t be adjusted right on SF. While I can use photo shop to create and while I can adjust the sizes each time to fit into the yardage, it is so time consuming when you want to print a variety of designs and sizes. Not fond of how the images get tiled and have seams when not the same size. We’ll be sure to pass along your feedback to our development team!